Marie Spartali Stillman (1844–1927), The Rose from Armida's Garden (c 1894), watercolour with bodycolour and graphite on paper, 64 x 42.5 cm, Private collection. Wikimedia Commons. In this scene (Canto 14, Esolen p 281), Rinaldo has been secretly pursued by Armida, who intends to murder him with her dagger. He stops to rest near the ‘ford of the Orontes’, and takes his helmet off. He first hears Armida swimming in the river, goes to see, and discovers her naked. She sings to him, and lulls him into an enchanted sleep so that she can thrust the dagger home. As she is about to do that, she falls in love with him instead. Rather than killing him, she enchants him and abducts him in her chariot, to a magical island where he becomes infatuated with her, and forgets the crusade. Anthony van Dyck (1599–1641), Rinaldo and Armida (1629), oil on canvas, 235.3 x 228.7 cm, Baltimore Museum of Art, Baltimore, MD. Wikimedia Commons. In Anthony van Dyck‘s (1599–1641) Rinaldo and Armida (1629), the key elements of the couple and attendant symbolic amorino are enriched by a second woman with non-human legs still immersed in the river and clutching a sheet of paper, and several additional amorini. Armida appears unarmed but starting to bind him with garlands (ready for abduction), and it is possible that the letter represents her mission to murder him, which the woman in the water, perhaps a nymph, is reminding her about. As these elements do not appear in Tasso’s poem, we can only speculate as to their significance in the narrative. Although van Dyck gives us rich cues from ‘body language’, Armida’s face is shown in profile and it is harder to read its expression and emotion as a result. 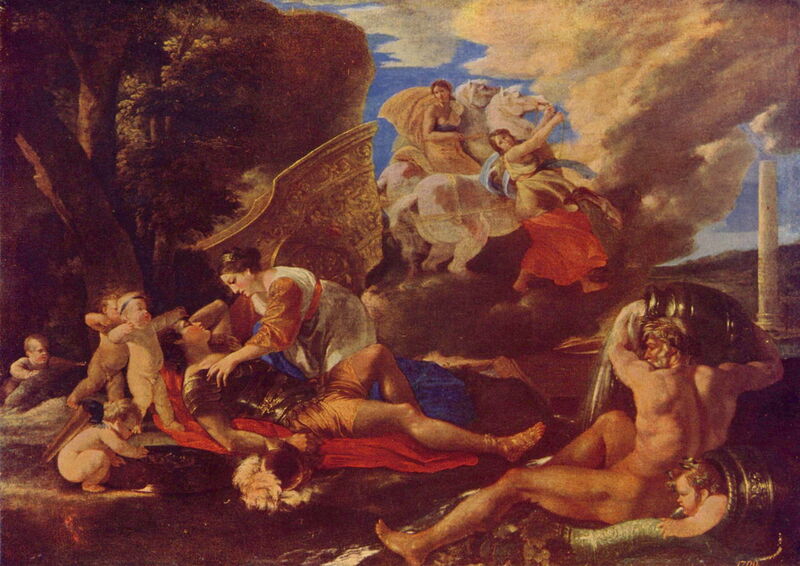 His overall composition is also more complex than Poussin’s, and less economical. This is Nicolas Poussin‘s Rinaldo and Armida (c 1630) for comparison, with its simple composition and clear cues. 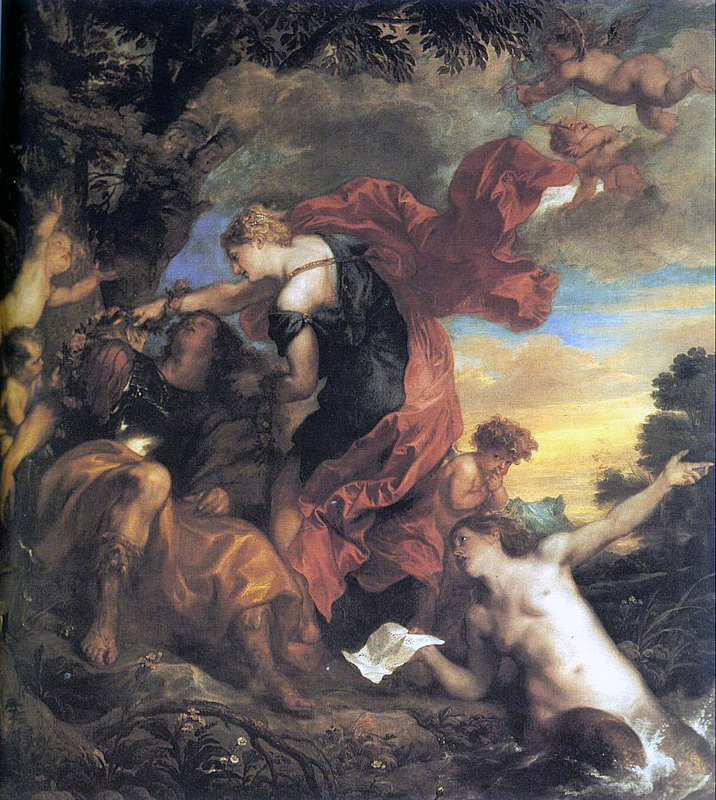 Poussin’s later Rinaldo and Armida (c 1635) shares some features with the van Dyck, such as multiple amorini and a different symbolic reference to the river. It also adds Armida’s chariot to the background, in preparation for the next event in the narrative, Rinaldo’s abduction. Antonio Maria Vassallo (1620-1624), Rinaldo and Armida (c 1635), oil on canvas, 116.5 × 141.5 cm, Museu Nacional de Belas Artes, Rio de Janeiro, Brazil. Wikimedia Commons. Antonio Maria Vassallo‘s (1620-1624) Rinaldo and Armida (c 1635) takes similar elements to van Dyck, but rearranges them in a very different composition. 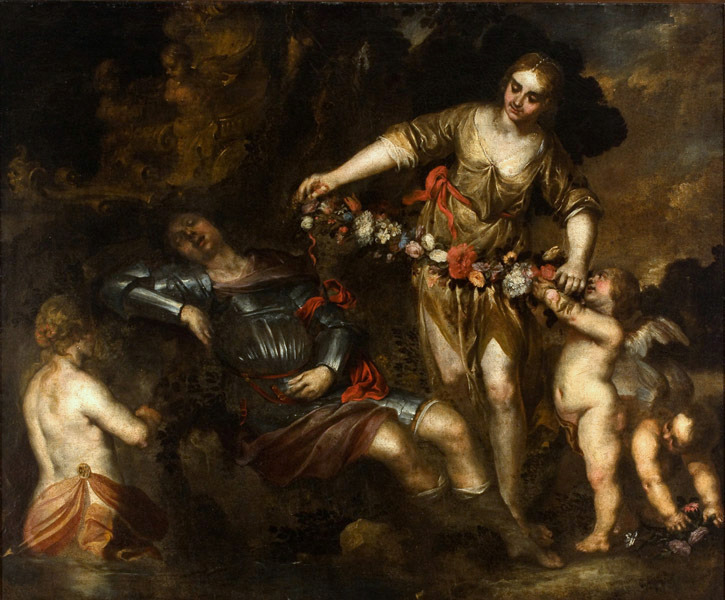 The river nymph appears on the left, rather that the right, and Armida is no longer in intimate contact with the sleeping Rinaldo, but holding out a garland of flowers, ready to bind him for abduction. There are no weapons to be seen, and the emotional cues of facial expression and ‘body language’ are largely absent. Were it not for the sleeping Rinaldo, it would be easy to interpret this as showing any of a large number of such romantic narratives of the day. Lorenzo Lippi (workshop of), Armida and the Sleeping Rinaldo (c 1647-50), oil on canvas, 286 x 173 cm, Kunsthistorisches Museum, Vienna. Wikimedia Commons. Lorenzo Lippi‘s workshop’s Armida and the Sleeping Rinaldo (c 1647-50) marks a return to earlier clarity: Armida is here seen clutching her dagger, but neither her expression nor ‘body language’ tell us of her conflict or change in intention. In the absence of amorini, there are no cues as to her overriding romantic desires. In terms of Poussin’s narrative, this shows but the first half of the event, significantly weaker than the emotional conflict which supervened. Willem van Mieris (1662–1747), Rinaldo and Armida (after Francis van Bossuit) (1709), oil on panel, 66.8 x 85.7 cm, Royal Picture Gallery Mauritshuis, Den Haag, The Netherlands. Wikimedia Commons. Willem van Mieris‘s (1662–1747) Rinaldo and Armida (1709), was apparently painted after an original by Francis van Bossuit. Somewhere in amongst its profusion of at least 31 amorini, Armida is shown apparently approaching Rinaldo, her right hand (which is unnaturally proportioned) about to touch his head. She is unarmed, her left breast and leg bared, but her face downcast so that its expression is obscured. A water nymph holds a mirror, which may be an allusion to the role of a mirror later in the story. It is not just the landscape which has become elaborate here, with garlands of flowers (bindings for his abduction) adorning the painting, and the amorini playing with Rinaldo’s helmet. 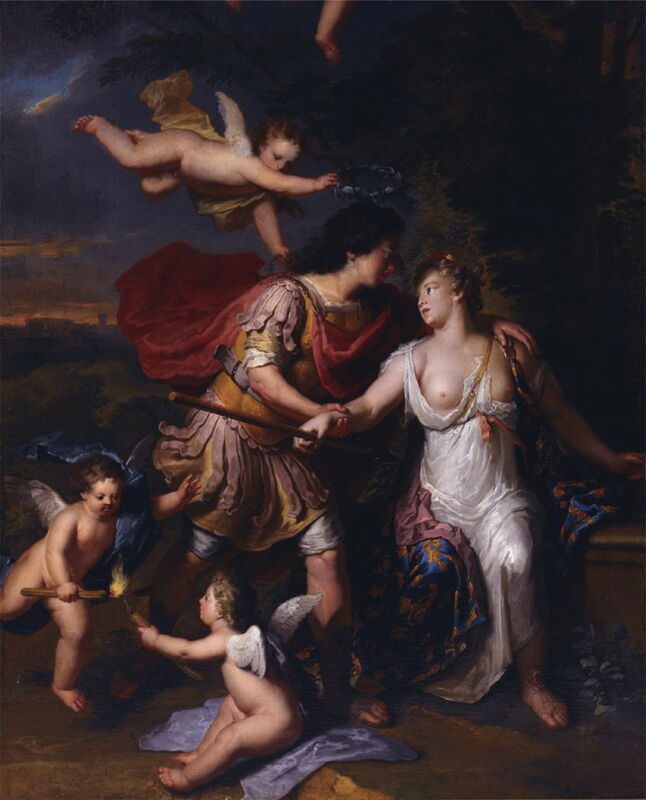 Sebastiano Conca (1680–1764) (attr), Rinaldo and Armida (c 1725), oil on canvas, 99.1 × 135.9 cm, Saint Louis Art Museum, St. Louis, MO. Wikimedia Commons. Sebastiano Conca‘s (1680–1764) Rinaldo and Armida (c 1725) is another return to simpler composition, based on a central triangle, and content. 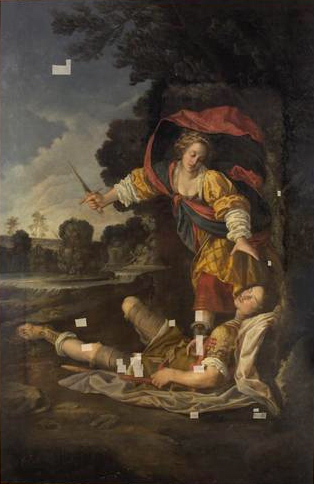 Armida is drawing her sword, and looking pensive, as the sole amorino reaches from above to intervene. Giovanni Battista Tiepolo (1696–1770), Rinaldo Enchanted by Armida (1742-45), oil on canvas, 187.5 x 216.8 cm, Art Institute of Chicago, Chicago, IL. Wikimedia Commons. 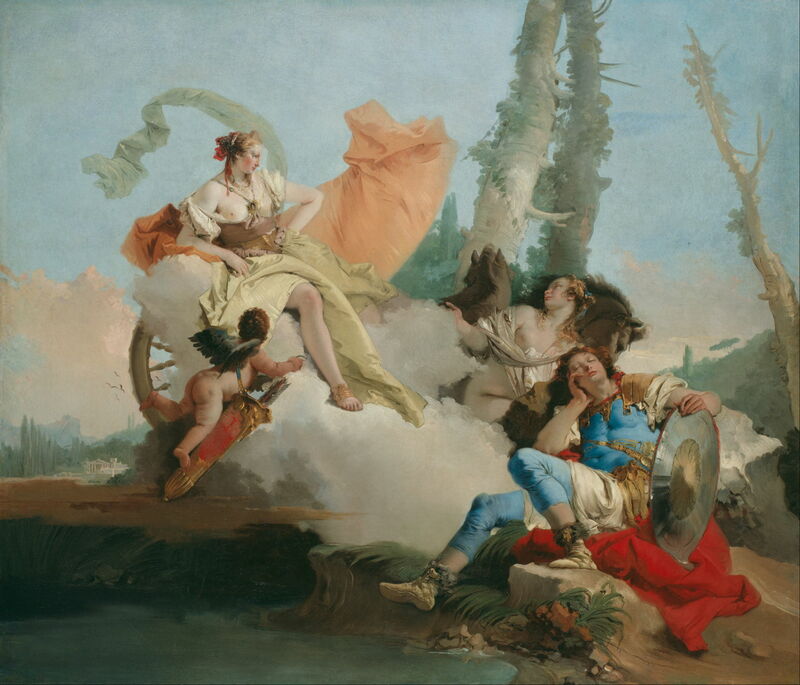 Giovanni Battista Tiepolo‘s (1696–1770) Rinaldo Enchanted by Armida (1742-45) is another permutation of the possible elements. Armida has already brought her enchanted flying chariot, in which there is another woman, perhaps Venus herself, with an accompanying amorino. Armida is almost undressed and unarmed, and her facial expression is more of unhappy pleading than internal conflict, while her female companion appears cold and unaffected. Jean-Honoré Fragonard (1732–1806), Rinaldo and Armida (c 1760-65), oil on canvas, 221.5 x 256.5, National Gallery of Armenia, Yerevan, Armenia. Wikimedia Commons. Jean-Honoré Fragonard‘s (1732–1806) Rinaldo and Armida (c 1760-65) is another elaborate painting with an abundance of amorini. Armida’s right hand clutches a dagger, and is restrained by two of the amorini, although it is hard to determine whether she has much facial expression. 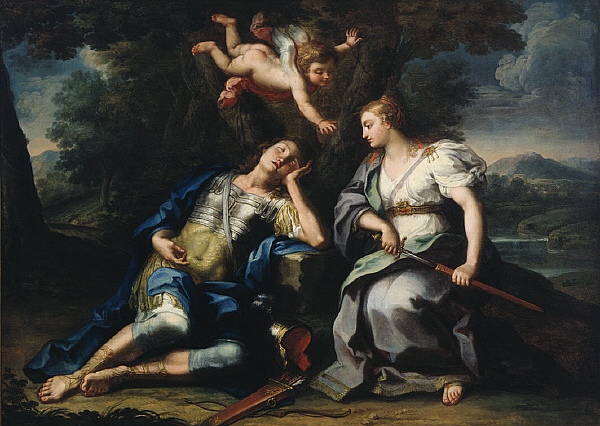 Francesco Zugno (1709–1787), The Sleeping Rinaldo (c 1760-70), oil on canvas, 50.5 × 120 cm, Rijksmuseum, Amsterdam. Wikimedia Commons. 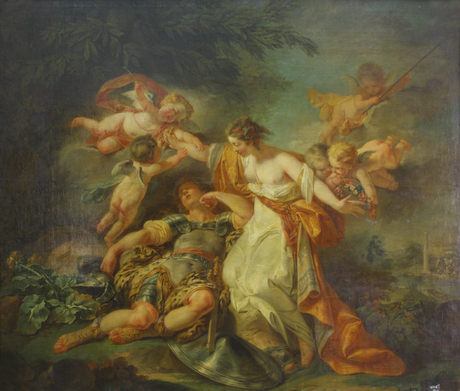 Francesco Zugno‘s (1709–1787) The Sleeping Rinaldo (c 1760-70) may have missed Tasso’s narrative altogether, showing Armida about to place a crown of flowers on the sleeping Rinaldo’s head. 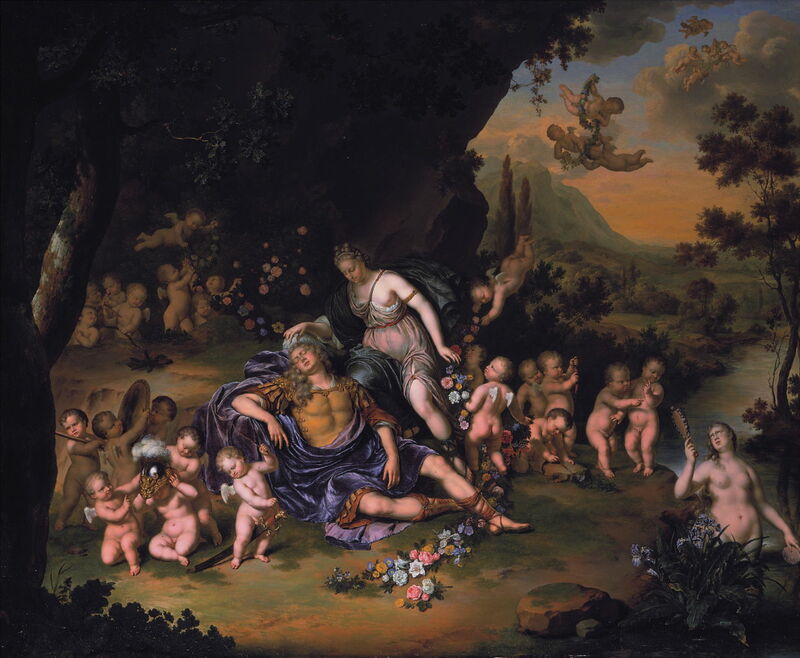 There is no sign of any previous murderous intent, and the attendant nymphs and amorini give the painting an air of peace and love, although they are at least bringing garlands to bind him. 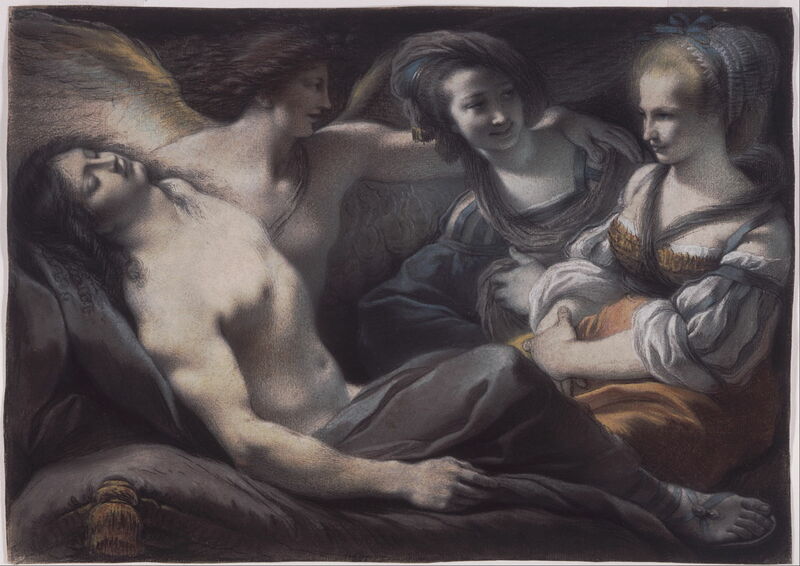 Giuseppe Cades (1750-1799), Armida Gazes on the Sleeping Rinaldo (c 1785), chalks on heavy cream laid paper, 31.5 x 44.1 cm, Philadelphia Museum of Art, Philadelphia, PA. Wikimedia Commons. Giuseppe Cades‘ (1750-1799) Armida Gazes on the Sleeping Rinaldo (c 1785) moves further from Tasso’s account, showing Armida and a female companion (probably a maid) gazing at the sleeping Rinaldo. Armida’s facial expression is close to being neutral, with perhaps a tinge of malice, and pensiveness. Behind Rinaldo there is another male who seems to be a grown-up amorino, but in that transformation the symbolic link is obscured. Just as popular images transfer today onto other objects like posters and T-shirts, so this couple found their way into manufactured goods. 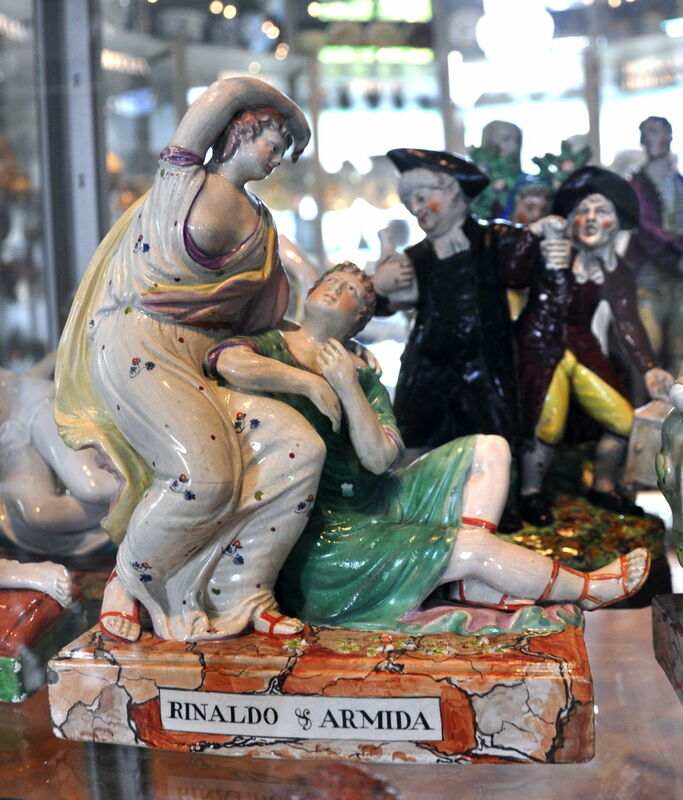 Anonymous, Rinaldo and Armida (c 1790), Lunéville ceramics, Musée Lorrain (Nancy). By Fab5669, via Wikimedia Commons. 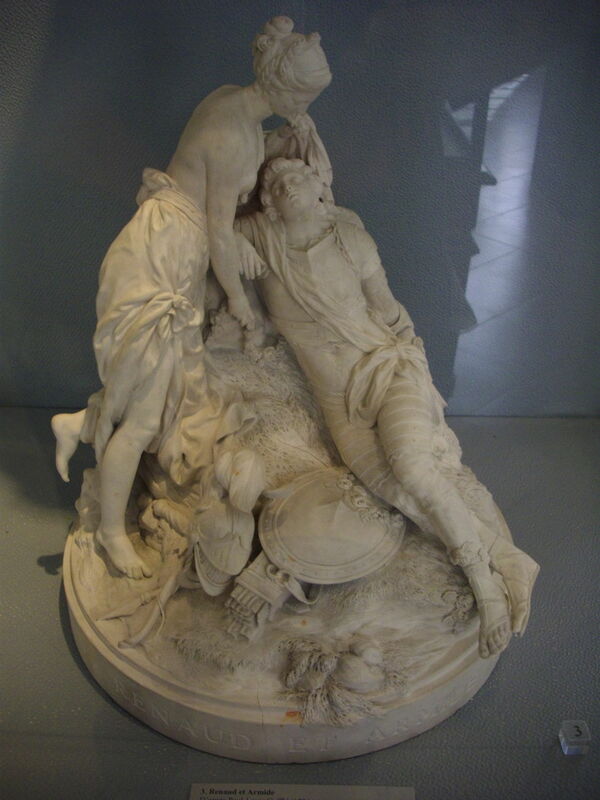 This Lunéville ceramic statue was made in about 1790, and includes most of the key elements from the paintings. However its narrative would be very challenging to read unless you read the inscription around its base. Anonymous, Figure group Rinaldo and Armida (c 1791-95), moulded lead-glazed earthenware, enamelled in colours, Lakin & Poole, Staffordshire, Victoria and Albert Museum, London. Photo by Andreas Praefcke, via Wikimedia Commons. Manufactured by Lakin & Poole in the Staffordshire pottery district in England around 1791-95, this moulded lead-glazed earthenware, enamelled in colours, has lost almost all the cues to the original narrative. Anonymous, after Angelica Kauffmann, Rinaldo and Armida (c 1798), porcelain cup and saucer, Kaiserliche Porzellanmanufaktur, Wien. Collection of the Prince of Liechtenstein, Vaduz-Vienna. By Gryffindor, via Wikimedia Commons. 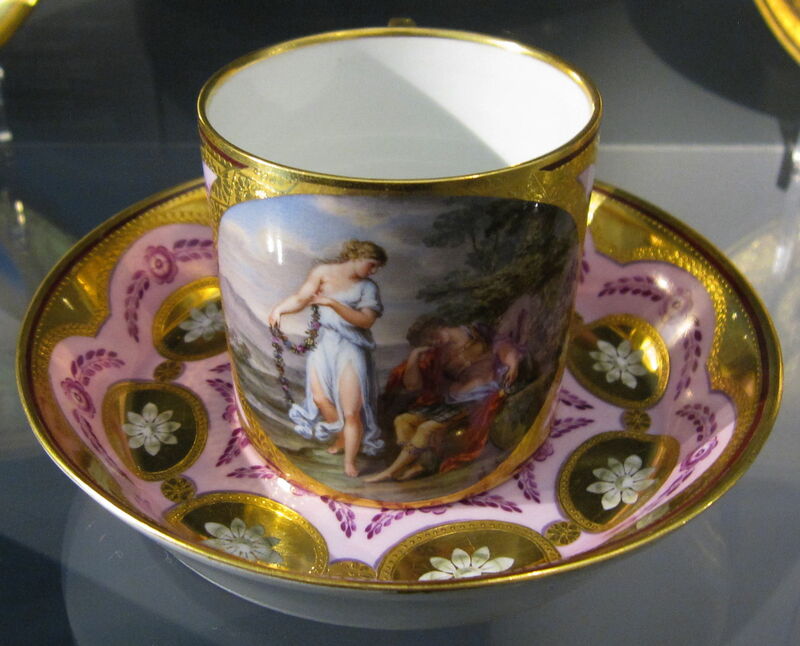 Here a painting by the enormously popular Angelica Kauffmann has been enamelled onto a porcelain cup and saucer by Kaiserliche Porzellanmanufaktur, Wien, in about 1798. The image of a Saracen witch entrancing, seducing, and abducting a warrior from the First Crusade may seem a strange one to accompany your cup of coffee. In the 1700s, as you have seen, Tasso’s account was being interpreted more liberally in paintings, and by the 1800s, conventional narrative accounts seem to have died out altogether. Gerard Hoet the Elder (1648–1733), Rinaldo and Armida (c 1700), oil on canvas, 118.5 x 96.5 cm, Private collection. Wikimedia Commons. Gerard Hoet the Elder‘s (1648–1733) Rinaldo and Armida (c 1700) appears more vague about which part of the narrative it is trying to tell. Rinaldo and Armida are dressed as if they are falling in love at their first meeting, and there are plentiful amorini in support. Armida is also brandishing a club, which she might have intended to use to kill Rinaldo had she not become enamoured with him. However the background does not appear consistent with that part of the narrative, and suggests that it might represent Rinaldo’s parting from Armida much later, despite the absence of Carlo and Ubaldo. None of this seems to fit with the actions of the two amorini at the lower left, who appear to be lighting firecrackers, which was never part of Tasso’s account. Angelica Kauffman (1741–1807), Rinaldo and Armida (1771), oil on canvas, 130.8 x 153 cm, Yale Center for British Art, New Haven, CT. Wikimedia Commons. 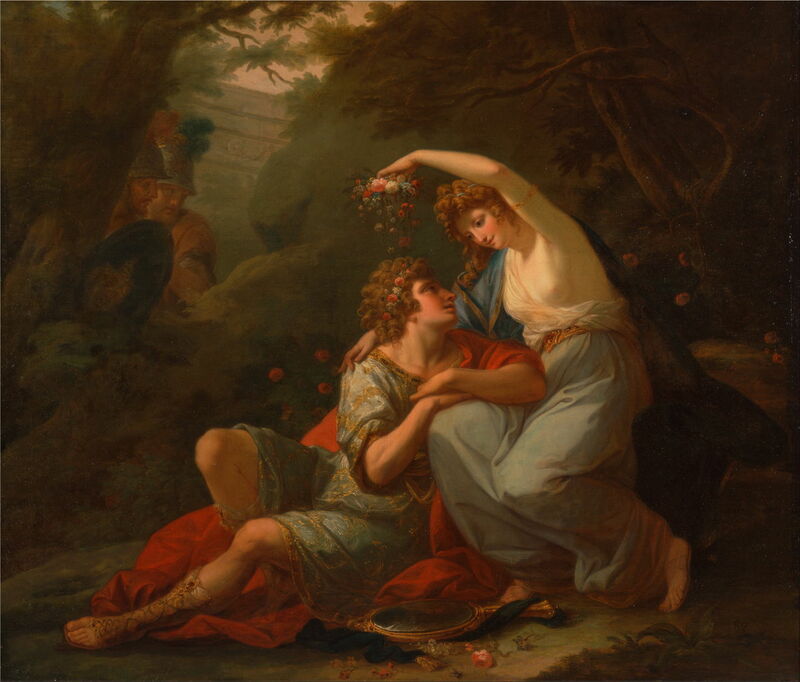 Angelica Kauffman‘s (1741–1807) Rinaldo and Armida (1771), which is quite different from the painting on the Viennese coffee cups, shows a much later scene in the story of the couple. In the background, Carlo and Ubaldo have just discovered them, and the diamond mirror is ready at Armida’s feet so that Rinaldo’s colleagues can get him to see himself in that mirror, and return to the Crusade. Kauffmann uses the conventional cues such as facial expressions and ‘body language’ very skilfully, and refrains from amorini. Charles-Alexandre Coëssin de la Fosse (1829–1910), Danish Warriors in the Garden of Armida (1848), others detail unknown, but believed to be oil on canvas and the original in colour. By Salon 1913, via Wikimedia Commons. Charles-Alexandre Coëssin de la Fosse‘s (1829–1910) much later painting Danish Warriors in the Garden of Armida (1848) (this image being a monochrome version of the original coloured painting) abandons Tasso’s narrative altogether. Now Carlo and Ubaldo appear as voyeurs to a couple of naked bathers. 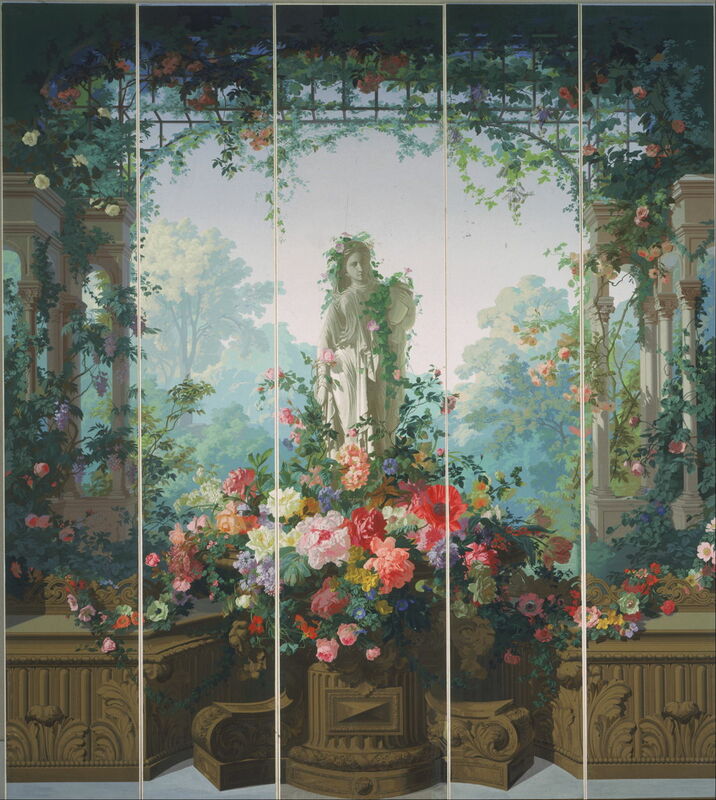 Édouard Muller (‘Rosenmuller’) (1823-1876), Garden of Armida (1854), block-printed wallpaper, 386 x 335.3 cm, Philadelphia Museum of Art, Philadelphia, PA. Wikimedia Commons. Édouard Muller, known as Rosenmuller, (1823-1876) produced some block-printed wallpaper showing the Garden of Armida in 1854, which has only the most tenuous connections with Tasso’s poem, and lacks even a shred of narrative. Marie Spartali Stillman (1844–1927), The Rose from Armida’s Garden (c 1894), watercolour with bodycolour and graphite on paper, 64 x 42.5 cm, Private collection. Wikimedia Commons. Tasso’s poem may have been the inspiration for Salon paintings during the 1800s, but the last work which I have discovered which makes explicit reference to it comes from the Pre-Raphaelite Brotherhood. 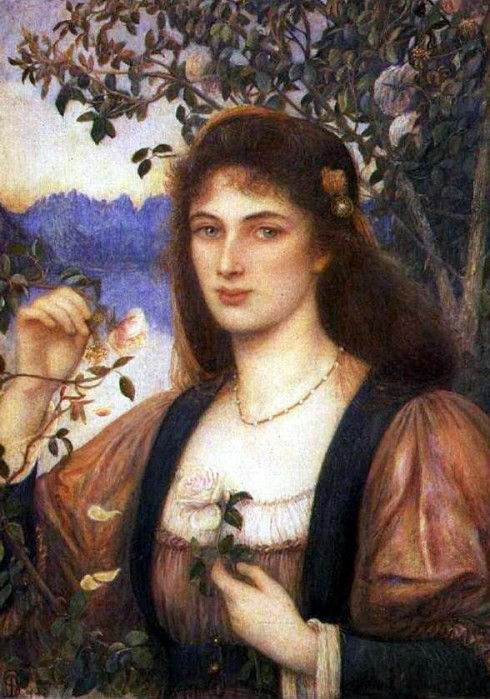 Marie Spartali Stillman‘s (1844–1927) The Rose from Armida’s Garden (c 1894) has since become a symbol among some feminists. Its references to Tasso are obscure, and its narrative either absent or deeply concealed. Rinaldo and Armida has been a popular narrative for painters from shortly after its publication and popularity, until the end of the 1700s. Various artists have used different combinations and variations of narrative devices, but during the 1700s there was a general weakening in narrative content. In the 1800s, paintings have either lost Tasso’s original narrative, or lost narrative altogether. Posted in General, Painting and tagged Armida, Crusade, Fragonard, Jerusalem, Kauffmann, Lippi, narrative, painting, Poussin, Rinaldo, Stillman, Tasso, Tiepolo, van Dyck. Bookmark the permalink.